President Barack Obama’s proposed budget for fiscal year 2013 sets a responsible course for rebuilding the economy so that it works for everyone, not just the privileged few. Our middle class is the engine of economic growth, but is threatened by dwindling public investments, a tax system increasingly rigged to benefit the wealthy, a fraying safety net, and assaults on what should be the bedrock guarantees of Medicare, Medicaid, and Social Security. The president’s budget protects those guarantees, boosts critical investments, and takes steps toward rebalancing the tax code so that all pay their fair share. And it does this in a fiscally responsible way, charting a path that nurtures the economic recovery while reducing the federal deficit, all without asking the middle class to shoulder a disproportionate share of the burden. The Obama administration’s fiscal year 2013 defense budget halts the unrestrained growth in baseline military spending that has occurred over the last decade, essentially holding the budget steady in inflation-adjusted terms through FY 2017. But it does little to bring the baseline budget back down from its current level, which remains near historic highs. If passed by Congress, the proposal would authorize $525.4 billion for the Pentagon’s base budget for the fiscal year beginning in October, a $5.2 billion or 1 percent reduction from this year’s spending level. The proposed budget recognizes that we can no longer afford the runaway growth in defense spending that has occurred since 1998. Achieving the first real reduction in military spending in more than a decade is a welcome and major achievement. We applaud the administration for using the fiscal pressures facing the Pentagon to realign military priorities to reflect 21st century threats. And while we are encouraged by the $487 billion the Pentagon says it will cut over the next decade, much more work remains to be done. This plan still avoids many of the hard choices facing the Pentagon—on weapons systems, personnel benefits, and nuclear weapons, to name but a few. The Obama administration has taken a small step toward a sustainable military stance with its latest defense budget. But throughout the debate surrounding the president’s budget request it will be important to remember one fundamental reality: This country needs a comprehensive budget agreement. In order to restore our fiscal health, we need investment in research and development, infrastructure, education, and a jobs bill. These domestic issues are the most pressing national security challenges facing the country. The Department of Defense budget cannot and should not be formulated in a vacuum, without regard to domestic priorities. Keeping this in mind, here are the marks we’re giving the U.S. Defense Department’s budget request. At first glance, nearly half a trillion dollars in reductions might sound like a huge cut. But in reality, if Secretary Panetta’s reductions survive Congress, the baseline defense budget will fall by just 1 percent, or $5 billion, next year and resume its growth thereafter. Because these “cuts” come from projected increases in defense spending, the Pentagon’s budget will continue to grow at about the same rate as inflation, as shown in Figure 1. President Obama and Secretary Panetta are reducing the amount that the Department of Defense plans to spend, but not enough to bring the budget down significantly. This stands in stark contrast with previous post-war defense drawdowns. President Dwight Eisenhower cut the budget by 27 percent after the Korean War, President Nixon reduced the budget by 29 percent after Vietnam, and the trifecta of president’s Reagan, H.W. Bush, and Clinton slashed defense spending by 35 percent after the end of the Cold War. Under the proposed reductions, in real terms, the Pentagon will spend about 8 percent less over the next decade than it originally projected. These cuts fall short of a number of bipartisan deficit-reduction proposals, including those of the presidentially appointed Deficit Reduction (Simpson-Bowles) Commission and the Gang of Six deficit-reductions plans. In fact, the Pentagon will still spend $2.73 trillion over the next five years, about $150 billion more than the $2.59 trillion spent over the last five years. This is not austerity. While the Defense Department’s plan for the next decade shelters the department from the cuts facing domestic programs, Secretary Panetta has skillfully used the budgetary pressures facing the department to create an opportunity to update and improve U.S. national security strategy for the post-Iraq and Afghanistan era. The cornerstone of the Pentagon’s efforts to achieve $487 billion in savings over the next decade is a reduction in the size of the ground forces. The Army, which added 65,000 positions to carry out the wars in Iraq and Afghanistan, will return to its 2005 size of 490,000. The Marines will shrink from 202,000 to 182,000. With the United States unlikely to undertake extended nation-building operations in the foreseeable future, this shift will move the U.S. military to a more agile and sustainable posture focused on protecting U.S. interests in the Middle East and Pacific. Similarly, the Obama administration’s plan to remove two brigades from Europe will focus U.S. military resources where they are most needed. There is no reason for the United States to continue stationing 70,000 troops on a stable continent that has more than enough resources to provide for its own defense. The 2010 Sustainable Defense Task Force found that given improved U.S. capabilities for long-range strikes and rapid troop transport, the United States can reduce its troop presence in Europe and Asia by one-third without harming American security or interests. Withdrawing 33,000 troops from Europe and 17,000 from Asia—far more than Panetta’s proposed withdrawal of two brigades—would enable savings $80 billion over the next decade. In its budget briefing book, the Pentagon announces that while personnel costs account for one-third of the baseline defense budget, just one-ninth of the reductions in this year’s budget plan come from military compensation or benefits. President Obama has demonstrated a deep and ongoing commitment to taking care of our men and women in uniform. But sheltering the Pentagon’s personnel costs from immediate reductions ignores the serious, long-term challenges facing the military’s retirement and health care systems, a problem that the Defense Department’s internal task forces have identified time and time again over the past four years. This fiscal year—FY 2012 ending in October 2012—the Pentagon will spend about $100 billion—20 percent of its baseline budget—on health care and pensions for military retirees, $52 billion on health care, and another $47 billion on retirement. These costs have more than doubled over the past decade and will continue to skyrocket and take an increasing share of the total budget unless significant changes are made. As noted above, the Obama administration is right to draw attention to the flaws in the military retirement system. Under current Defense Department policy, service members who spend 20 years in the military become eligible for a generous pension; those who serve less than 20 years leave with nothing. There are two major flaws with this system. First, it leaves the vast majority of our men and women in uniform without any retirement savings when they leave or are forced to leave the force. Only 17 percent of service members serve the 20 years necessary to become eligible for retirement benefits; 83 percent do shorter stints in the armed forces and then leave. Additionally, no distinction is made between those who have served multiple combat tours and those who have not. As a result, young enlisted troops—who have borne the brunt of the burden of the wars in Iraq and Afghanistan but generally do not spend 20 years in the military—are the most likely to be left without retirement benefits. Second, the current system provides little incentive for service members to remain in the service once they hit the 20-year mark. About 76 percent of men and women who reach 20 years in the service leave before their 25th year. Inequitable and unsustainable, the current military retirement system is not serving the majority of our troops or the department as a whole. But a congressional commission may lack the political capital necessary to achieve meaningful change on such a divisive and politicized issue. Secretary Panetta should use his authority to work with Congress and guide the reform process himself. The Defense Department’s FY 2013 budget request includes $48.7 billion for the Tricare military medical insurance program, a 300 percent increase over its fiscal year 2001 budget. Due to this cost growth, nearly 10 percent of the baseline defense budget will go to providing health care to active duty service members, military retirees, and their dependents. If these costs are allowed to continue to grow over the next decade, health care costs will consume an increasingly large percentage of the budget and draw funds away from other crucial national security initiatives. To control costs in the Tricare military health care program without asking more of our active duty service members (who will continue to receive health care at no cost) or lower-income or disabled veterans (who receive health care through the Department of Veterans Affairs), the Center for American Progress has long recommended restoring the cost-sharing balance between military retirees and the American taxpayer. Over the past 15 years, Congress has failed to adjust Tricare fees to keep up with skyrocketing increases in health care costs. In fact, the health care fees paid by military retirees have been raised just once since Tricare was created in the mid-1990s. As a result working-age military retirees pay just $520 per year for health coverage for an entire family. As a result, the administration wisely announces new fees for working-age military retirees, based on their ability to pay, as well as an enrollment charge for retirees over 65 who enroll in Tricare-for-Life. Most significantly, after 2016, enrollment fees will be pegged to medical inflation, ensuring that Congressional inaction will not again imperil the military’s health care system. These reforms are a strong step towards restoring the fiscal sustainability of the Tricare program, while also ensuring that all retirees continue to have access to affordable health care. For the wealthiest working-age retirees, annual enrollment fees will quadruple to about $2,000—still far less than most civilian plans—while retirees with pensions of less than $22,589 will pay just $893 per year. Going forward, to bring down costs more rapidly, the Obama administration should examine phasing in the changes by FY 2015—rather than waiting until FY 2017—and it should requiring working-age retirees who are eligible for civilian coverage to accept coverage from their private employer. 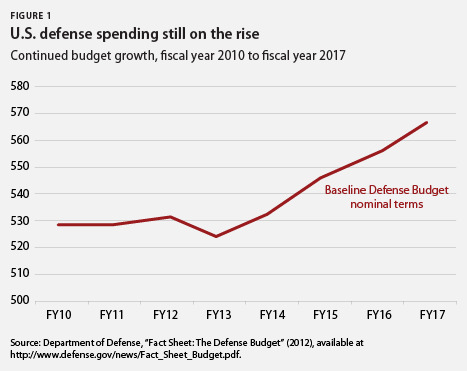 With the 10-year plan in their FY 2013 budget, President Obama and Secretary Panetta have halted the real growth in the baseline defense budget. But as our country struggles to confront its budget deficit problem over the next decade, there is much room in the Pentagon budget for additional cuts. Implementing these bipartisan recommendations will allow the Pentagon to responsibly draw down its budget without negatively affecting American security. Since 2001, the cost of each F-35 has risen from $69 million to $159 million, and estimates of the lifetime operational costs of the F-35 warplane have more than doubled to $1 trillion. As a result, the F-35 is on track to be the most expensive weapons system in U.S. history. Last week, the Pentagon’s acquisition chief, Frank Kendall, said the Pentagon’s decision to rush production on the fighter before it had completed a successful test flight was “acquisition malpractice.” Sens. John McCain (R-AZ) and Carl Levin (D-MI) have also released a letter publicly questioning Secretary Panetta’s decision to take the Marine Corps’ version of the plane off probation despite serious technical problems and massive cost overruns. The Department of Defense is right to slow production of the fighter to allow time to fix the plane’s design flaws. But time alone may not be enough to make the F-35 program a sensible investment in the long-term. Alternative fighter jets such as the F/A-18E/F Super Hornet continue to be effective for the Navy and the Marines, so cutting the F-35’s Navy and Marine variants—while allowing the Air Force to keep its entire buy—would help control spiraling costs in the program without compromising American air superiority. The V-22 Osprey helicopter has long been hampered by cost overruns and technical problems. A May 2009 Government Accountability Office report found that “in Iraq, the V-22’s mission-capability and full-mission-capability rates fell significantly below… rates achieved by legacy helicopters.” Given the V-22’s high price tag—it costs five times as much as other models—and lackluster performance, there is no reason for the Defense Department to continue sinking money into this program. Terminating the V-22 would save $2 billion in FY 2013 and at least $10-12 billion in the next decade. Our massive nuclear stockpile is a relic of the Cold War, expensive to maintain, and largely useless in combating the threats facing the nation today. According to strategists at the Air War College and the School of Advanced Air and Space Studies, the United States requires only 311 nuclear weapons to maintain a credible deterrent, rather than the 1,550 allowed under the New START treaty. Such a reduction would save at least $11 billion a year. The United States currently fields 11 aircraft carriers when no other country has even one of comparable size and power. Given this tremendous imbalance, the Pentagon could hold off building additional carriers, which cost $15 billion each, and consider retiring two of our existing carrier battle groups. The U.S. Navy currently possesses more firepower than the next 20 largest navies combined—many of which are U.S. allies. With such an overwhelming advantage, the Pentagon can maintain U.S. military superiority while reducing procurement of the Littoral Combat Ship to two per year. President Obama and Secretary Panetta have done well to regain control of defense spending in their FY 2013 budget plan. The budget halts the massive growth of the defense budget since 2001, holding the budget stable in inflation-adjusted terms. Moreover, the administration has used the fiscal pressure facing the Pentagon as an opportunity to achieve a much needed update to U.S. security strategy, moving the U.S. military away from Cold War tactics toward an agile and sustainable posture focused on protecting U.S. interests in the 21st century. Nevertheless, much work remains to be done, and the FY 2013 budget leaves a number of underperforming, outdated, or unsustainable programs untouched. Excess defense spending does not make our country safer—it adds to our debt and diverts resources away from key investments here at home. In these times of fiscal austerity, each dollar spent on defense pulls funds from critical investments in the American economy—the real foundation of the United States’ global power. 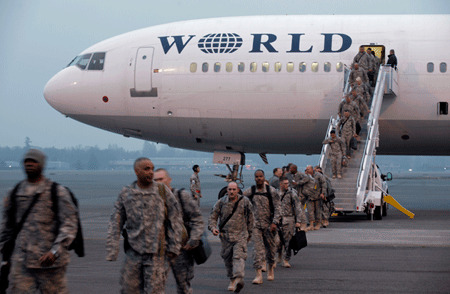 In the past decade, the United States squandered its power attempting to build nations overseas. In the coming decade, we must refocus our attention here at home. Lawrence J. Korb, a Senior Fellow at the Center for American Progress, served as assistant secretary of defense in the Reagan administration. Alex Rothman and Max Hoffman are Special Assistants on the National Security and International Policy team at the Center for American Progress.